David Munnelly is one of the best button box players to come out in years. Technique and speed are leavened by soul and a deep understanding of the heart of the tunes. David's brother, Kieran Munnelly, plays the bodhran and a flute bordering on the South Sligo style. 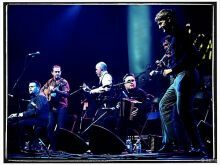 Also on show are the multi-instrumental talent of Paul Kelly and Fergal Scahill, and the fabulous vocal talents of Donegal singer, Shauna Mullin. This is a truly exciting band. The energy of youth meets real ability. Highly recommended. Great show.